These words of Jesus remind us that true peace is not simply the absence of war, the cessation of hostile action, or the lack of violence, as the world might have us think. The peace that Christ gives burns within human hearts that see the beauty of God reflected that see the beauty of God reflected in all of creation, especially in men, women, and children, all of whom are crafted in his image and after his likeness. To be at peace with Godâ€”forgiven and reconciled-is manifested by being at peace with all humanity, treating others as we ourselves wish to be treated. No one in history demonstrated this Christ-centered peace more than our own patron saint, Francis of Assisi. Because he recognized God's beauty reflected in all creation, he was not only at peace with all, but he was able to call everyone and everything "brother" or "sister," even Sister Death whom Francis welcomed when she came to carry him home to his Heavenly Father on October 3, 1226. Essential to this life of peace is union with the Father, through the Son, in the Holy Spirit, so at this time, as we prepare to celebrate the Feast Day of St. Francis, we intensify our prayer for Christ's peace. Shortly after the terrorist attacks on the United States on September 11, 2001, the Conventual Franciscan Friars, who then had custody of the National Shrine, composed a novena to help us cope spiritually with a tragedy beyond anyone's ability to comprehend. As we approach the tenth anniversary of 9/11, we would like to send you an updated version of that novena for peace. In the National Shrine of St. Francis of Assisi, we will be praying this novena prayer each day beginning on October 4 and continuing on the eight days following, after the ancient tradition of the Church to mark a major feast with an octave. Our Masses for the Solemnity of St. Francis of Assisi will be celebrated in the Shrine Church on October 4 at 12:15 p.m. and 7 p.m. We would be honored if you would send us your special prayer requests to be remembered at those Masses, as well as at the Masses on the eight days following. Please write to us and request your copy of the Novena for Peace and to send your prayer requests. 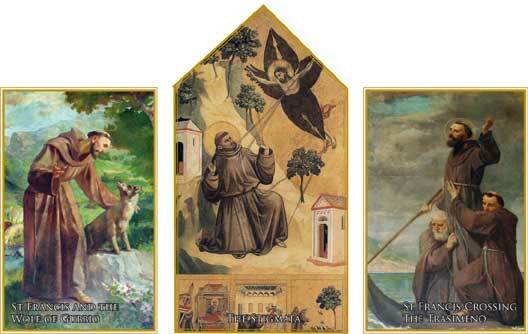 If you can, please enclose a gift for the work of the National Shrine of St. Francis of Assisi. This year, we will be installing a new heating system for the church but we have other needs, not the least of which is an elevator so that people who cannot manage the steps leading to the Shrine can still access this magnificent sanctuary dedicated to our city's patron saint. I am hoping that some of you will be able to make sizable donations despite today's economic difficulties and hardships. A gift to the National Shrine of St. Francis of Assisi is an investment in constant prayer for peace.